I wrote this book in the immediate aftermath of Trump’s election. The air was thick with mourning, dread, and above all else, shock. But it was the kind of shock that galvanized rather than paralyzed. That was clear from the protests taking over streets in my city, from the meetings organized in my building’s basement by people looking to volunteer with local community groups, and even from the old friend who told me over coffee that since November he had decided to get more involved in his kid’s school. In various ways, people were processing that they could no longer go about their lives and leave to its own devices a system that had just given ultimate power to a DayGlo asshat who would be rejected by movie directors as too cartoonish a villain. There was a widespread sense that something was deeply wrong, not just with Trump and his party, but with . . . everything. But what exactly? Millions of anguished conversations during those early months tried to probe that question, but most were unable to get too far before they returned to two blunt but powerful thoughts: I just can’t believe it and I’ve got to do something. Those sentiments produced the Women’s March, the airport protests against the Muslim travel ban, and the other crucial resistance that has greeted Trump from the day he took office. But action alone without a guiding political framework can only get us so far before we’re herded back into the harmless pens of safe opposition—the corporate-owned candidates, the online letters to Congress—that helped get us into this mess to begin with. 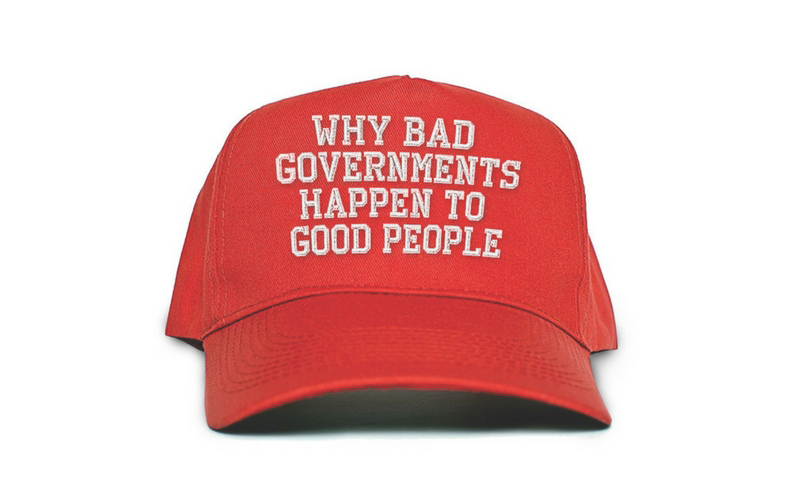 So while many good books are being written about how Trump won, and many others about what we should do about it, Why Bad Governments Happen to Good People looks at these subjects and others through the lens of the more existential questions that clung to all of us last November like smoke from a burning building. As I worked through the early months of 2017, I had no idea how many chapters might be obsolete by the publication date. Some days I thought Trump might not last another week. Other times it looked like resistance was futile. As it turned out, the book is quite pertinent. For all of the stunning events that have happened on a weekly basis over the past nine months, the central dynamic remains the same: Donald Trump is not at all popular, but he doesn’t need to be in this pseudo-democracy until resistance is powerful enough to stop him. The other thing that hasn’t changed is the shock. Our minds still reel every morning to find that the DayGlo asshat has threatened nuclear genocide, stripped young immigrants of their legality, and complimented a deadly hurricane on how big it is. We still can’t believe it, and we still have to do something. I hope this book helps you figure out what it is you have to do.